Having realized that analysis of text data can allow a better understanding of consumers’ priorities and overall behavior, a constantly rising number of companies across the globe are focusing on the enhancement of their text analytics capabilities. Text data is being swarmed in from sources such as e-mails, social media platforms, and consumer reviews on company web portals, creating mounting volumes of business critical data. In the intensely competitive market, where competitors are leaving no stone unturned to align strategies with consumer preferences, text analytics prowess is expected to be a major determinant of success for companies in the near future. Transparency Market Research, in one of its recent market intelligence reports, states that the global text analytics market will exhibit an exponential 17.6% CAGR from 2015 to 2024. The market, which had a valuation of US$2.82 bn in 2015, will rise to US$12.16 bn by 2024. In 2015, the military and defense sector accounted for a dominant share of 19.7% of the overall text analytics market. However, this end-use segment is projected to lose its attractiveness to the IT and telecom sector in the next few years. These flourishing industries are expected to incorporate an increased number of text analytics solutions for achieving improvement in visibility in market trends, internal processes, and core operations. The world is currently on the verge of a digital revolution, and the telecom and IT sectors, which constitute the core competencies enabling digitization, will witness vast global expansion in the next few years, and will require effective text analytics solutions at a rapid pace. The market for text analytics will exhibit an 18.5% CAGR in the IT and telecom sector from 2016 to 2024. The on-premise mode of deployment is currently the most preferred for text analytics solutions across the globe. On-premise IT solutions that process critical data hold the promise of added security and low risks of breaches as the data remains confined within an organization’s infrastructure or corporate network. Owing to these benefits of on-premise deployment, this medium accounted for a massive 84% share in the global text analytics market in 2015. However, on-premise solutions are expensive as they require installing added infrastructure capable of processing the application, resources that are dedicated solely to practice, and purchasing licensed copies of software products. As such, this mode of deployment is limited mostly to large enterprises with the necessary funds. As an increased number of small- and medium-sized companies demand text analytics solutions, the cloud mode of deployment, known for its cost-effective nature, is gaining increased prominence. It is expected that cloud-based text analytics solutions will expand at a CAGR of 20.2% from 2016 to 2024 in the global market. It is no doubt that cloud will present the most lucrative development opportunities ahead of text analytics companies in the near future. 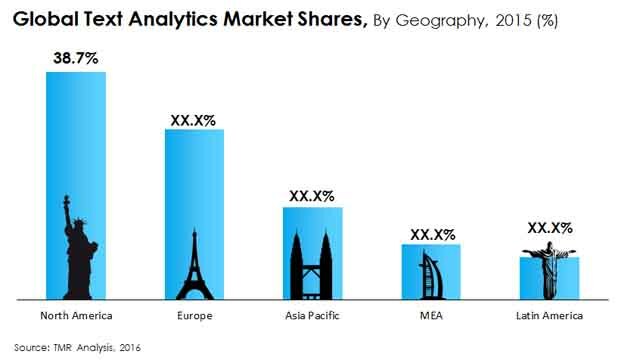 Developed regions such as North America and Europe are equally attractive for the text analytics market owing to the large numbers of social media followers, technologically advanced industrial infrastructures, and rapid growth of digital platforms such as e-Commerce and social media marketing. These factors are projected to enable both these regions in presenting attractive growth opportunities for the global text analytics market in the next few years. Although North America is presently the dominant region in terms of market valuation among these two regions, it is expected to witness stiff competition from Europe in terms of the rate of development of the market. From 2015 to 2024, North America text analytics market is expected to exhibit a 17.8% CAGR, while Europe is expected to marginally lag, with 17.2% CAGR over the same period.